The Best PHP web hosting is offered by InMotion Hosting. As a premier web hosting company servicing small businesses and web professionals, we understand how important PHP is to your website. That's why we are dedicated to providing the best PHP hosting in the industry; offering popular tools like suPHP. Fast, flexible and pragmatic, PHP powers everything from your blog to the most popular websites in the world! InMotion Hosting has been a trusted leader of website transfers throughout the web development community since 2001. That's why we exclusively offer a free, no-hassle guarantee transfer of your website - because we're the best at making the whole process painless. Our free transfer process applies to accounts that consist of 3 or fewer cPanels, databases and/or websites. If you have more than 3 accounts, websites or databases, we can still transfer your site over for $10/item transferred. You can also transfer your website yourself, and if you need help we have an extensive Support Center to help walk you through the process. InMotion Hosting guarantees that we will be 100% dedicated to transferring your website as efficiently and rapidly as possible. Unfortunately, some transfers don't always go as smoothly as possible because clients have difficulty getting information from the host they are transferring from, or they don't have time during the transfer process to reply to emails or chat with an InMotion Hosting representative as immediately as they'd like. Please know that the transfer process is a collaborative effort, and that InMotion Hosting will always be available 24/7/365 to transfer you to the best web hosting in the industry. Award winning 24/7/365 U.S. Based support on chat, email, & phone. Our Shared Hosting performs up to 20x faster than traditional HDDs. We backup our servers every 24 hours. Others charge, we don't! InMotion Hosting allows an unlimited amount of Data Transfer per month on all of our Business Class Web Hosting accounts. Much like arbitrary disk space limitations, we'd rather focus on the key aspects that help Small & Medium Businesses maintain a successful online presence. This is why every Business Class Web Hosting account includes powerful features such as our Premium Web Site Builder, regular data backups & a full list of added features; all backed by our Award Winning World Class Support. Certain restrictions apply, see Terms of Service for details. With Business Hosting, you don’t have to worry about limitations affecting your business. Create unlimited email accounts for your business and domains. All of our Business Hosting plans offer unlimited email storage. But if usage starts to affect your hosting “neighbors”, we might notify you to find a better plan to suit your needs. Included for free. Don't Be Fooled! 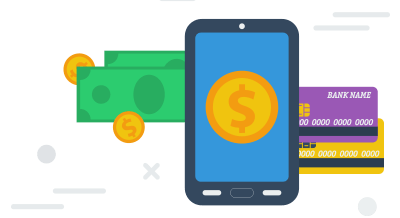 Unlike the others who claim to offer 6 websites on 1 account, or even 10 websites on 1 account, we're different because we don't have any hidden setup fees or hard to find additional monthly charges. Our web hosting packages are plain and simple - host multiple websites on 1 account for one low price. 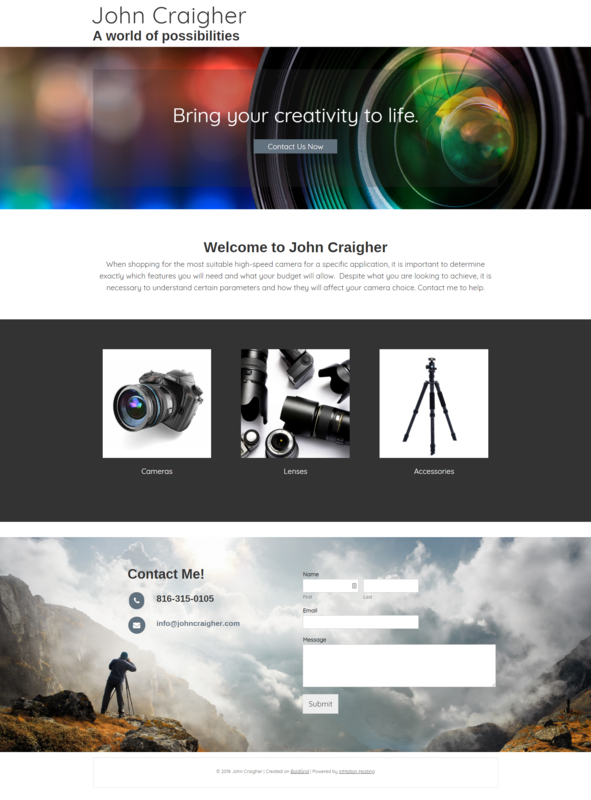 Get a one-page professionally designed website live in 2 business days. 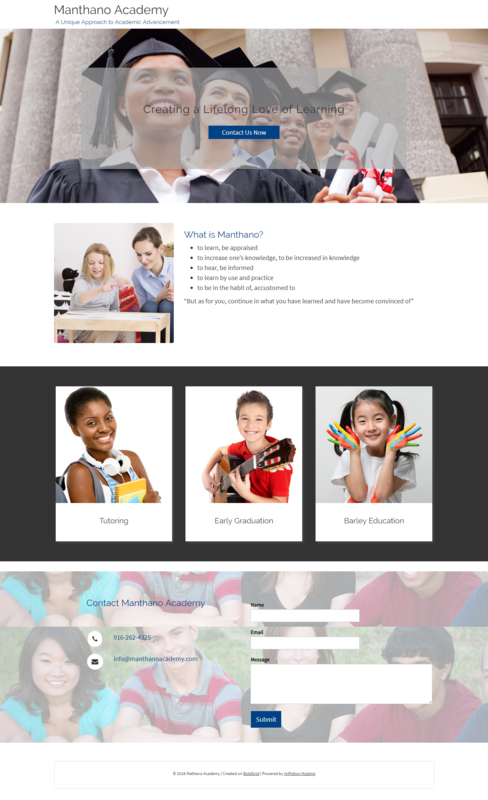 These are not templates but actually designed by a web design expert especially for you. 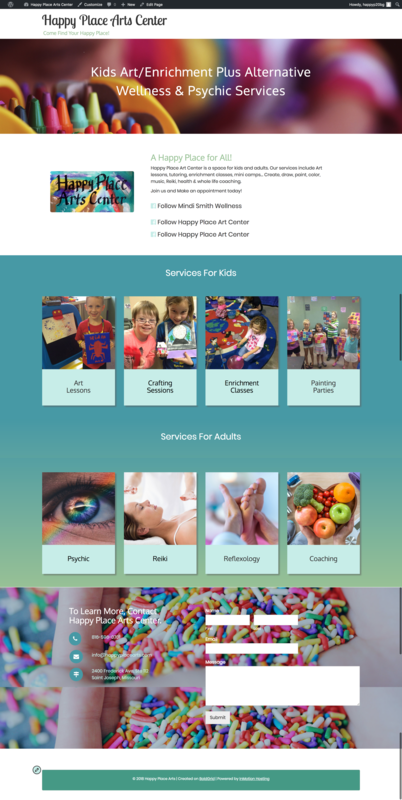 The website will contain all of your critical business information including a contact form and links to your social media profiles like Facebook, Twitter, Instagram etc. 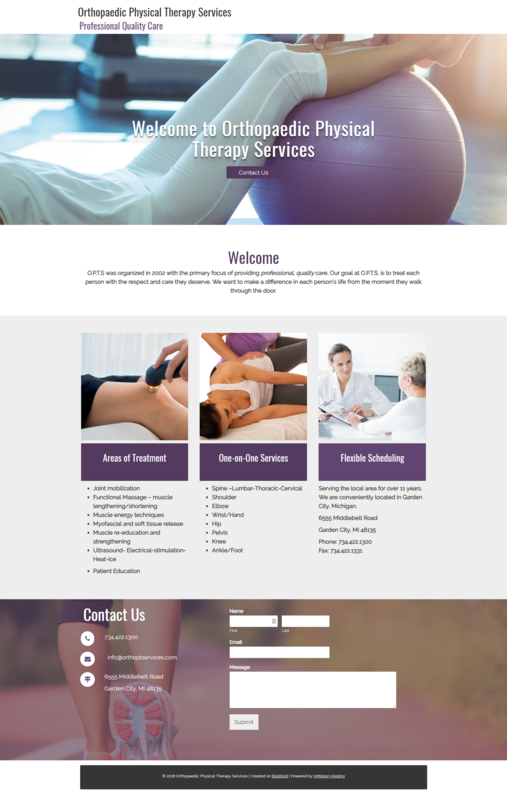 The designed website will be responsive and mobile-friendly out of the box. Basic SEO optimization is included to help with how your website ranks on Google search results. We even set up a professional business email address for you and connect a lead generation form to it. Say goodbye to @gmail.com email addresses for your business. QuickStarter uses the WordPress framework. So if you ever need to add pages or change content, you can do it yourself. Or you can purchase additional design services from us. QuickStarter is available on all Business Hosting Plans for a one time fee of only $99. Your hosting plan comes with BoldGrid, a free drag-and-drop website builder. 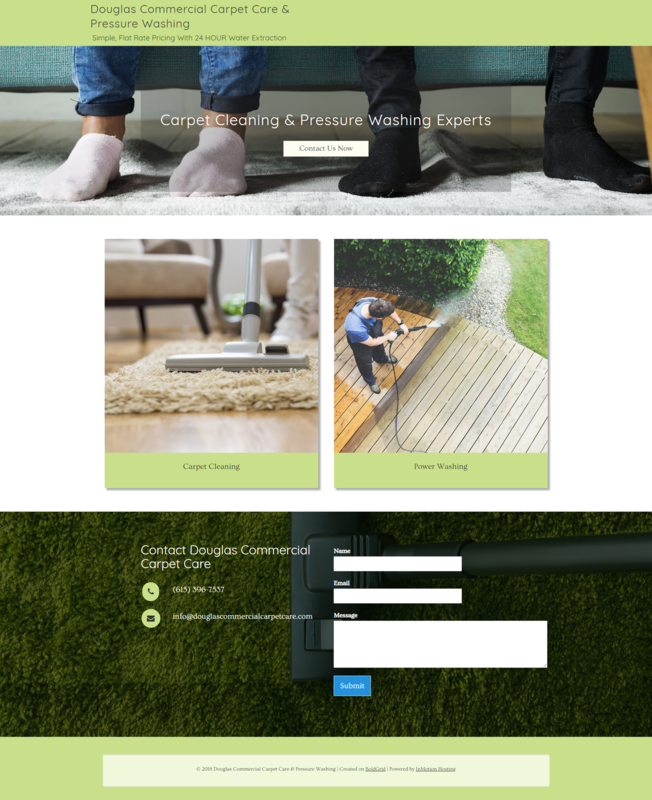 Our builder is easy to use whether you are building a site for the first time or have a few under your belt. InMotion Hosting built BoldGrid on WordPress, the #1 CMS in the world. You get the stability, security and flexibility of the WordPress platform. And BoldGrid brings true drag-and-drop capability. You also get free content written specifically for your industry, and can easily source images on the web all within the builder. Unlike other WYSIWIG website builders, with us, you own your site 100%. You can start building your new website right after you sign up or transfer your websites first and then decide how you would like to create new websites using our builder. Since our Pro plan offers almost UNLIMITED everything (websites, domains, databases, emails, and more), we created an SLA that ensures we deliver to you 99.9% uptime. Our goal is to keep your sites online and functioning. If we don't accomplish our goal, we'll credit you with free hosting. Read our Pro Plan SLA for details. Easily manage multisite WordPress installations or download and update plugins – all from the command line. When it comes to managing multiple WordPress installations, WP-CLI saves you time. Business-class hardware is the key to a fast and reliable website. We only use enterprise quality Dell servers which are tested thoroughly before even leaving the factory. We utilize RAIDed fault tolerant Samsung SSD drives for super-fast I/O, redundant switches and routers, and the highest quality power and cooling equipment in our datacenters. Your website files are scanned and patched for vulnerabilities and malware and any potential exploits are quarantined to prevent damage to your site and data. However, upgrading your software is still the most effective way to combat security problems. 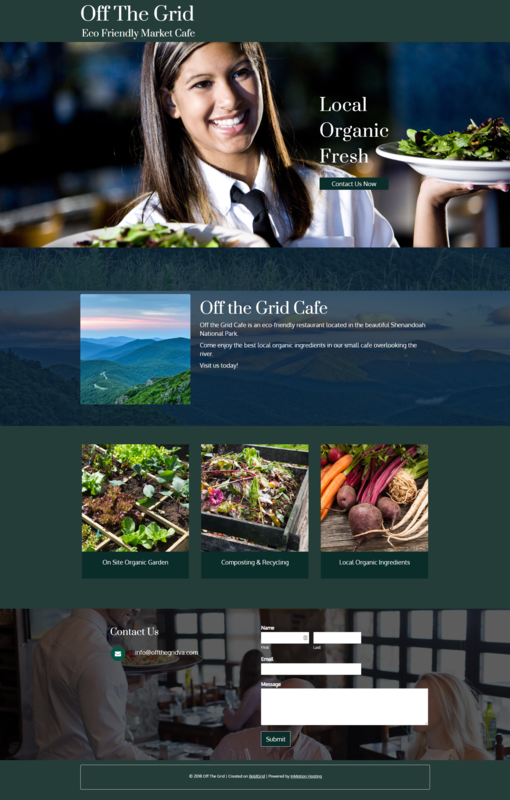 Looking to easily build beautiful websites? Get up to $150 in FREE Advertising Credits with any Business Hosting package! We strive to make your workflow as efficient and secure as possible. This is why we provide both SSH access and suPHP. Use SSH to securely connect to your shared server and quickly run commands. With suPHP, your files are locked down and only editable by the site owner. When combined, SSH and suPHP gives users increased workflow performance and security to manage their servers. We provide the multiple coding languages so that you can develop your website or application in the language that's most efficient for you. Develop the front-end and utilize databases that are most efficient for what you are building. For Google Apps users, our easy to use three-step wizard lets you setup your Google Apps account with your domain easily. Users need to only select their domain name they want associated with their Google Apps account, then select the services they want included. That's it. We include this easy setup free of charge to all Business Hosting customers. As a business with an online presence, the protection of your data and web files is of the utmost importance. In the event of a catastrophic system or user error, valuable data can be lost in moments. The backing up of your data and web files can help insure that the recovery of that data is as smooth as possible. While most hosting companies allow you to backup your own data, InMotion Hosting goes a step further and backs up customer data every 48 hours. 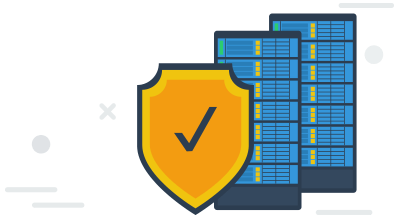 While you shouldn't rely solely on automated data backups, you can rest assured that InMotion Hosting is doing everything possible to insure the safety of your valuable data. *Certain restrictions apply, see terms for details. Our Business Hosting plans offer our customers the ability to install over 400 applications with 1-click. These applications include popular CMSs such as WordPress, Joomla, Drupal, and shopping carts such as PrestaShop and OpenCart. Best off all, our application installer also allows 1-click application updates and safe rollback. This means you can update your application to the latest version with 1-click. The safe rollback feature means that if the newer version breaks your plugin, theme, or any other critical feature, then you can simply roll your entire application back to the previous version. We take great pride in the reputation of our company and strive to resolve any issues that our clients may have. The Better Business Bureau is the leading agency in the country for consumers researching the companies they deal with. InMotion Hosting has continually maintained an A Rating with the BBB for nearly 5 years. We strive to provide the highest level of customer satisfaction. Our reputation as one of the leading web hosting companies in the country is important to us. This is reflected in the reviews and recommendations of our clients posted on websites such as WebHostingReviews.com. Shared Hosting is an entry-level web hosting product that is both the most popular and the least expensive, often attractive for small and medium businesses, blogs, portfolios and websites with moderate amounts of traffic. With Shared Hosting, multiple websites share a large server and its resources, including storage, bandwidth and disk space. With Shared Hosting, the web host is responsible for all of the server maintenance and upkeep. All of InMotion Hosting's Business Hosting plans are Shared Hosting plans. 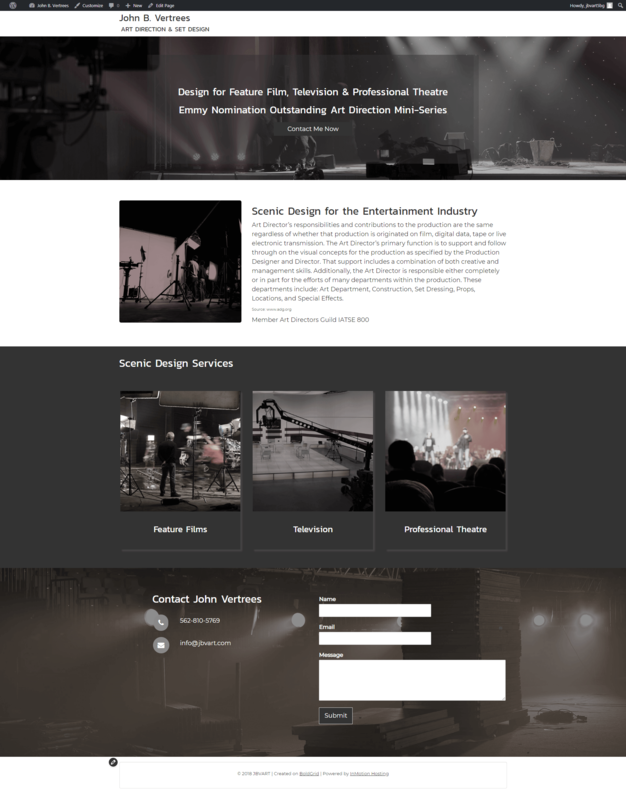 InMotion Hosting makes it easy for new web developers to get their sites up and off the ground. All of our Business Hosting plans come with Softaculous, an application installer that will allow you to download over 400 applications to help you with your website. These applications include, but are not limited to, Content Management Systems (CMS) such as WordPress, Joomla and Drupal, Online Marketplaces such as Prestashop, Magento and OpenCart, and many others. Shared Hosting is a perfect environment to develop and hone your programming skills and provides a number of tools for novices. Yes. InMotion offers free website transfers to make sure your site is moved to our servers without any downtime and without losing any of your important data. This applies to website transfers that consist of 3 or fewer cPanel accounts, databases and/or websites. If you have more than 3 accounts, websites or databases, we can still transfer your site over for $10/item transferred. You can also transfer your website yourself, and if you need help we have an extensive Support Center to help walk you through the process. You are ready to start building your website(s). Once you have purchased your Shared Hosting package, log into AMP and explore options such as registering and transferring domains, accessing cPanel, purchasing SSL certificates, setting up your email, submitting website transfer requests and much more. You can also log in to cPanel and begin installing applications such as WordPress. We have a number of education channels relating to getting your account set up. If you run into problems, don't hesitate to reach out to our helpful support staff for help. Also, make sure to look to our 100+ Small Business Resources and Tools for Entrepreneurs and Startups to help with marketing, graphic design and project management tools. It's a free resource guide for anyone looking to optimize their website's performance. All of our Shared Business Hosting plans are placed on ultra-reliable Samsung SSD drives. These super fast drives reduce data retrieval times so that your content is delivered when your audience demands it. Easily install over 400 applications With our 1-click auto-installer Softaculous. Keep your blog or ecommerce site up-to-date with one click, or even roll-back to a previous version. Checkout our most popular CMS platforms: WordPress, Joomla and PrestaShop. InMotion Hosting offers a 90-day full money-back guarantee for all of our Business Hosting plans. Come to us knowing we completely guarantee your satisfaction or we will give you all of your money back. Quickly run commands, change permissions, monitor logs, restart services, and securely manage databases on the best Shared Hosting servers. SSH also encrypts your data which helps prevent third party users from accessing your sensitive information. I have 3 sites hosted on Arvixe but after numerous problems with server crashes, WordPress issues and theme installation trouble, not to mention the horrendously long waiting times for support, I decided to switch to another host. After searching online for "best WordPress hosting," I saw that InMotion was featured in almost all reviews as being one of the best, so after talking to Adam and Austin and having them answer all of my annoying questions, I signed up for the Launch Plan. After I changed the nameservers, my site was ready to go again after about 10 minutes! Everything seems to be working fine and the page load speeds are super fast! Thanks for the great service, hope to be a long time customer!" Looking for a More Powerful Hosting Plan? All servers come with solid-state drives, performing up to 20x faster. We include a cPanel license with all hosting plans ($200/year value).